Merri Travels on Endurance.net: Which Knot? Apparently, we had a Knot contest here last night. Team Turnout vs Team Lame Pen. 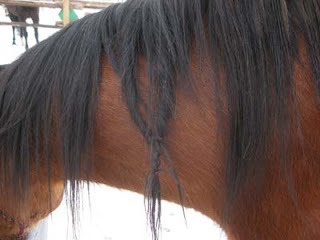 Team Turnout: Dudley and Finneas put a Witch Knot in Jose's mane. It was a medium sized one, but a good one. Intricately divided and twisted, half-hitched and diamond hitched and flipped inside and out, entwined together and woven apart and back together, the Knot defied logic. Team Lame Pen: Stormy, Kazam, and Princess worked on a Wish Knot in Quickie's mane. It was much like Jose's, just a miniature version, but intricate nonetheless. Wish Knot/Witch Knot - I call it both. So tangled it's a Witch Knot, and I sure Wish this Knot was not in there. 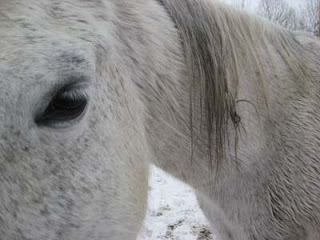 I took care of a forest service horse, Zak, who, every year, for the 9 years that I knew him, came back from his winter turnout with the same Witch Knot in his mane. Same huge mess, same place in his mane. Every year. 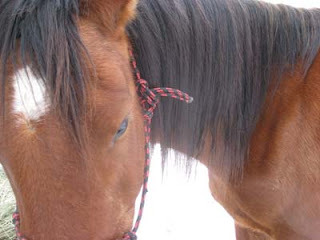 Sometimes he developed one during the summer too, same place in his mane, same big tangle. So I haltered Jose and took him out for an appointment at the Owyhee Hair and Snack Spa, set him up with a wheelbarrow full of the good hay (a special treat), and worked on his mane Knot. 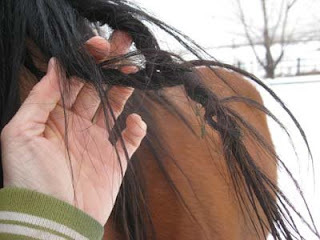 Mane Detangler or Showsheen or Cowboy Magic are great for working knots out without losing too much hair. So is cooking oil if you're desperate (and if you're going to shampoo afterwards), and so is any hair product with silicone in it. It took a while, but I got the Knot out, and Jose once again had a smooth, straight, shiny, mane. Jose and Team Turnout won the Wish/Witch Knot Contest. 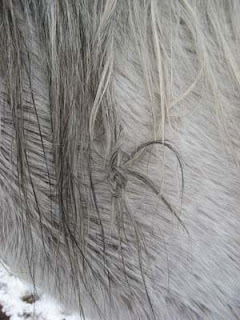 So, seriously, what's up with the Wish Knots in the manes this morning? Jose and Quickie NEVER have knots in their manes. Was it a Horse Hair Witch? Did the horses get together and work on this, and if so, with what - their noses? Their teeth? Their hooves? Was it a Weather Witch - the sheer sheets of ice that came down last night, followed by 2 inches of snow? 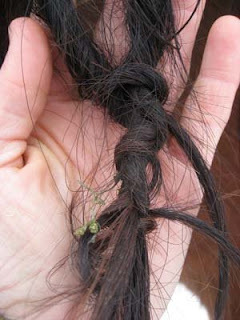 Don't you think it's very odd that it would just be a coincidence that two horses who never get knots in their manes both had them this morning? Sometimes I prefer not to believe there's a scientific explanation.